I am proud to announce that I am working with Sherwin-Williams for our Master Bedroom Makeover! Sherwin-Williams provided all of our paint as compensation for the post. All views and opinions expressed in the post are my own and no other compensation was provided. We are back! And a lot has happened since last week with our master bedroom one room challenge. Make sure you check out my week 1 post where you’ll find a tour of our master bedroom and the inspiration mood board I created to get our design juices flowing. This week I am excited to announce I have partnered with Sherwin Williams for all our painting needs! And for this makeover we have lots of painting needs. When it comes to paint I must say Michael and I have become quite the color experts over the years. We have painted a total of seven places we've lived together in their entirety. Not to mention we have had our far share of colors in our own master bedroom from yellow to brown to bright green and of course beige, didn't everyone go through the beige phase! Then we went ahead and added in some blue (our last color), and the one Michael likes to remind me of all to often that isn’t blue, but purple. 😬So clearly we like color! Thank goodness Michael is AMAZING at painting too. When selecting our color choices for this master retreat we really wanted to stay neutral to create a space that I can change the elements of depending on the season or my mood! I think this was the biggest down fall to our last color choice. We both knew we wanted to stick to a gray. Adding in the accent wall came as we fell in love with our color options from Sherwin-Williams. To get us started we headed to our local Sherwin-Williams to check out all the paint options in person. We then brought home the swatches and started to narrow down the colors in our actual space with the natural light we get. My favorite part of this whole process is seeing how Michael and I see colors. We lined them all up pulling out the swatches we felt were too beige or too blue leaving us with 3 gray options and 2 dark accent wall colors. From there we picked up paint samples for around $5 each to paint on our walls and live with for a little while before making our final decisions. I love this part. When you first put the paint on your wall it always looks so different than it is actually going to be when it dries. Not to mention the lighting changes in every room making the paint color change with it. We like to put a couple samples in different spots of each wall to really get an idea of what the color is going to look like. This time around the gray was easy. We both immediately knew what color we wanted. 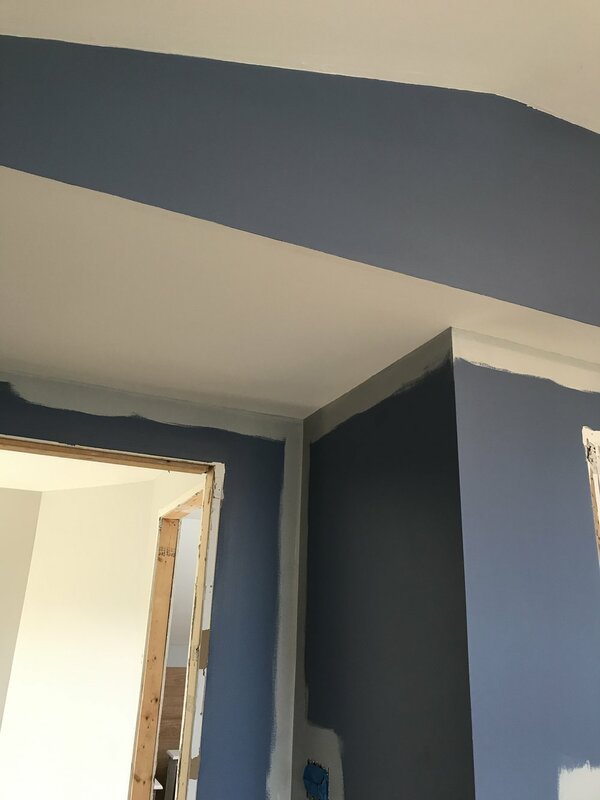 The accent wall took me a little bit of time to land on my final decision, although Michael knew right away😊 When we had finalized our paint choices it was time to get to work. We started the week off prepping our built in dresser. This needed a lot of work. We removed all the old hardware and Michael filled all the holes with some heavy duty wood putty. As much as we wanted to keep the same sizing for hardware, because it would have been a lot less work, we just couldn't find anything in that size we loved and we both felt like the hardware was just to small for the size of the drawers. Trust me, it was. Once all the holes were filled and dry we sanded them down with an electric sander. Michael hooked it up to our vacuum to help contain all the dust from sanding! 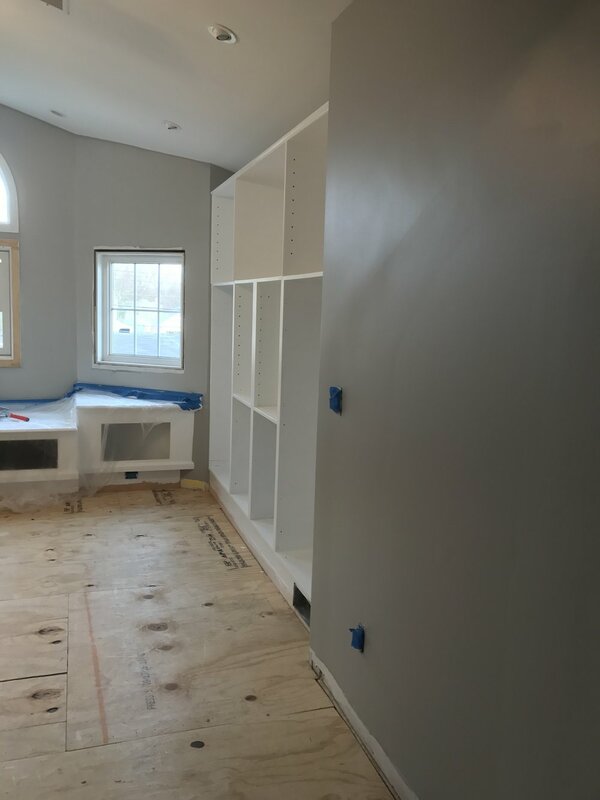 Once we finished this part we started in on the accent wall! Because our room is so large we felt the wall with our headboard on it needed to stand out. To help achieve this look we choose Sherwin-Williams Iron Ore (SW 7069) and I must say I am so glad we did ❤️❤❤ The dark color works well with all the natural light we have inside this room. I'm seriously wondering if I am going to wish we did all the walls this color...I guess only time will tell. The rest of our room is painted in Sherwin-Williams March Wind (SW 7768). I love how calm this shade makes me feel and it speaks oh so neutral! I can't wait to start decorating already! Oh....wait we need floors first. Yes floors would for sure help! As would doors and trim…soon! I am loving this makeover already and cannot wait to share more with all of you. If you aren't already make sure you follow me over on Instagram and Facebook to see more live updates on this wild one room makeover challenge!